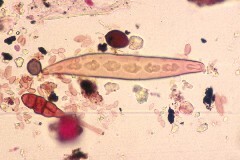 Spores of Drechslera occur individually and have very thick walls. In additions the septa (cross walls) between cells appear to be incomplete and are called pseudosepta. 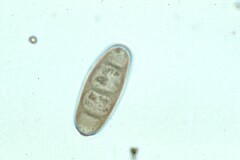 The shape of the spores varies. They can be straight, slightly curved, club-shaped, cylindrical, or elliptical. 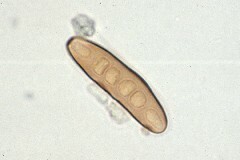 The texture on the surface of the spores is usually smooth, but occasionally may be warty. 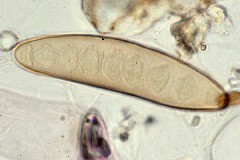 Several genera of very similar fungi including the genera Drechslera, Bipolaris, Helminthosporium, and Exserohilum have very similar spores and this spore type should be called Drechslera-type spores. The fungi are either plant pathogens or saprobes in the natural environment. 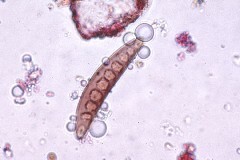 Spores of Drechslera represent one of the more common spore types found in many atmospheric conditions. They are known to be allergenic and can also cause fungal sinusitis.